A sweet and classic hand lettered new baby boy card in celebration of the arrival of a precious new bundle. This charming new baby card makes the perfect choice for the arrival of brand new baby boy. Featuring our classic, hand lettered typography, the phrase 'A Precious, Little Son' is written in deep black ink, layered over pretty hand drawn botanical illustrations and finished with a soft grey envelope. Our cards are printed on to luxuriously textured, FSC Certified, 350gsm Card and teamed with a recycled 120gsm envelope. Each card is individually wrapped in a protective, 100% biodegradable cello sleeve. 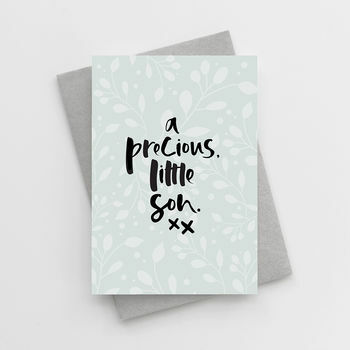 'A Precious, Little Son' New Baby Boy Card is 10.5 x 14.8cm (A6) and comes with a 11.4 x 16.2cm (C6) envelope.